Businesses conduct SWOT analysis (strength, weakness, opportunity and threats) in assessing their performances and also in formulating strategies. But this kind of analysis can also be helpful for employee development within the company. It is assumed that every employee in the company has personal development goals, such as career goals, that they may find difficult to achieve. Achieving personal development is essential for your growth as an individual. It helps you feel more confident and less insecure about your own self especially when you would take on challenges in your life. Regardless of the difficulty of achieving it, one way of having these personal development goals can be achieved by conducting a personal SWOT Analysis. 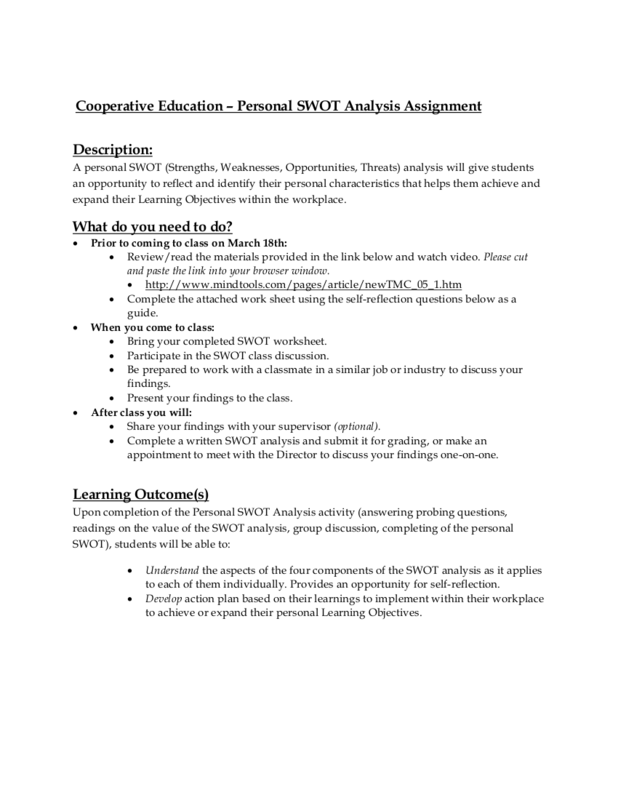 Even though SWOT analysis is primarily used in business organizations, it can also be helpful in assessing the performance of an individual. This analysis has a simple structure that can easily provide guidance. Self-analysis may be one of the most difficult things to do but it really plays a significant part in your path towards achieving your personal development goals. 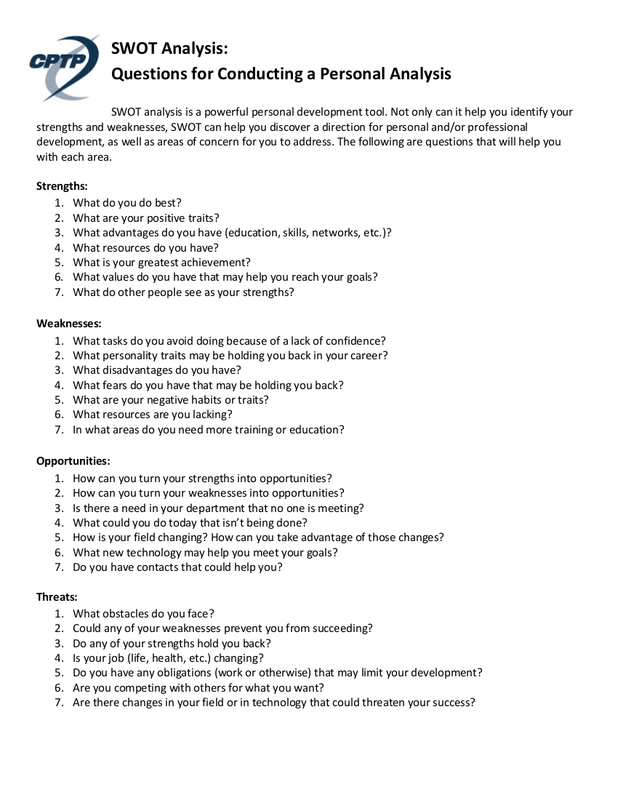 Conducting personal SWOT analysis can be helpful for you in knowing more about yourself and how you take that knowledge to your own advantage. 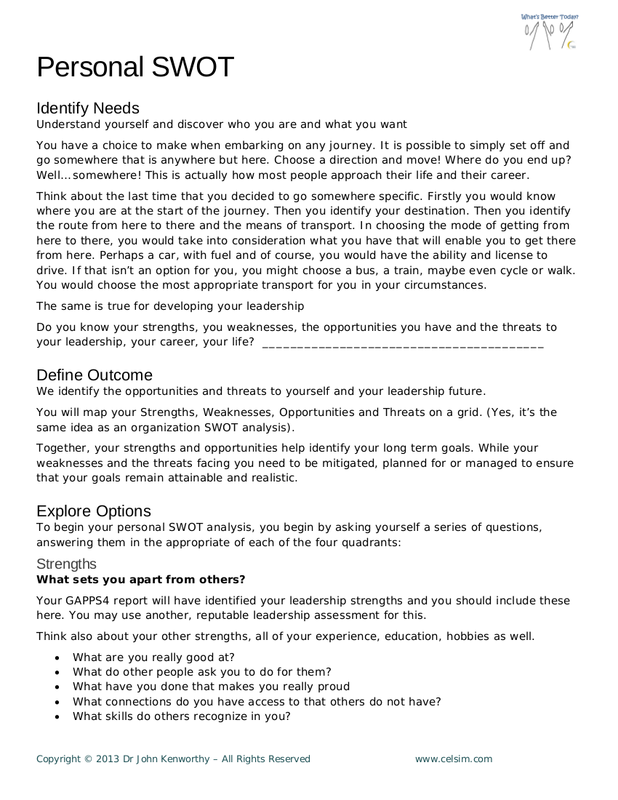 Here are ten examples of SWOT analysis that can be used to assess your personal development. Weakness – These are the areas that you need improvement on or that there are other people who can do tasks better than you. Opportunity – These are the possibilities where you can take an advantage of, or where your talents, skills, and capabilities can flourish which leads to the achievement of your dreams, goals, and ambitions. Threats – These are the things that prevent or keeps you from achieving your dreams and goals. 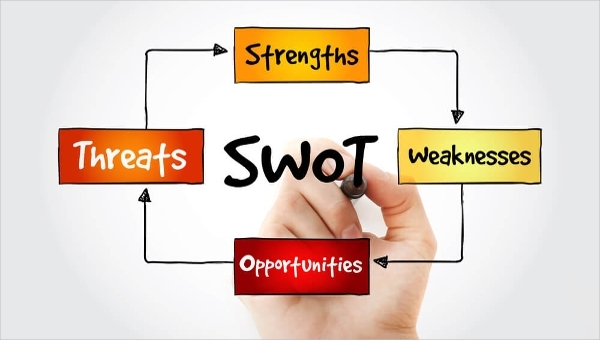 SWOT analysis deals with both internal and external factors. Strengths and weaknesses are your internal qualities which are also your advantages or disadvantages (i.e. talents, skills, and capabilities, points for improvement). Opportunities and weaknesses deal with the external factors— the possibilities that you should either take advantage of or avoid from completely. 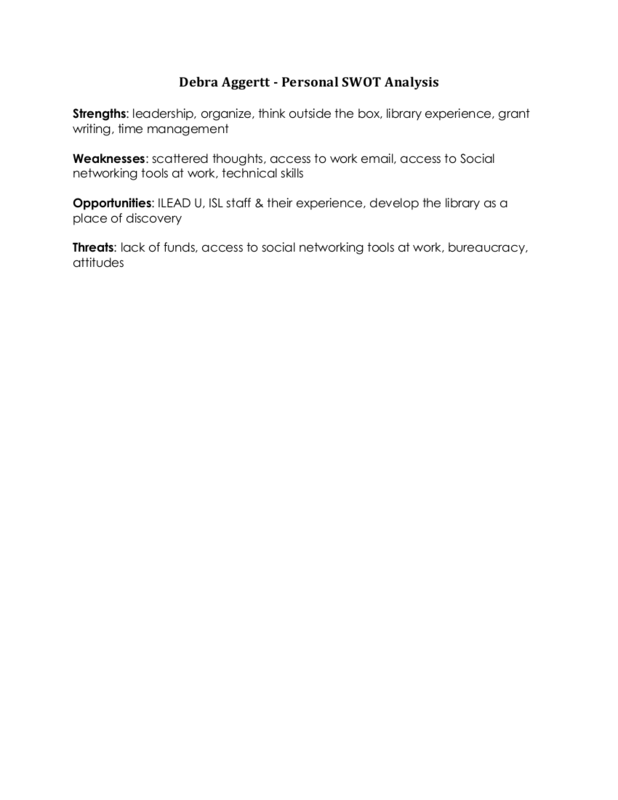 Conducting personal SWOT analysis is easy because you can do this on your own. Just by asking yourself with the following questions for each category, you can already analyze yourself. What advantages do you have that others don’t have? What personal resources do you have within your reach? What are your achievements that are unlike everybody else’s? What values, ethics, and principles do you have that others do not possess? Are you part of an organization that no one else besides you are affiliated with? Do you have connections with influential people both local and international? What are you good at naturally or what are your natural-born gifts? What skills have you worked on to develop? What tasks are you not confident in doing? What do people see as your weakness? What are your negative work habits? Do you fall short in your daily attendance? Do you have a disorganized work space? Do you have a short temper? Do you have a hard time in handling pressure and work? Do you have personality traits that hold you back? Do you lack or see the need to improve your education or training? What are the points that you need to greatly improve on? What are the negative feedbacks you have heard from people regarding your performance? Are there new innovations in technology that can help you in improving or developing your skills? Is the industry you are currently in growing? How can you take advantage of it? Do you have a strong network that can help you or at least give you pieces of advice when it comes to the field you are currently in? What trends do you see in the industry your company is specializing in? How can you take advantage of such trends? Have your competitors failed to see an opportunity that you have already seen? Will you take advantage of it? What obstacles are you trying to overcome at work? Do you have workmates whom you consider as your biggest threats? Does your job description keep on changing? Is your job unnecessarily demanding? Are the innovation in technology threatening your current position? Are your weaknesses leading to possible threats? Does your weaknesses limit you from getting a raise or getting promoted in your current job? Are there other external dangers that hinder you from achieving your goals? Are there new professional standards you cannot meet? If so, are you willing to take on additional training in order to meet such standards? Are there other external factors, such as financial or physical health, that hinder you from taking additional training in order to meet new professional standards? While conducting a personal SWOT analysis, you have to make sure that you are honest with yourself in answering the aforementioned questions. 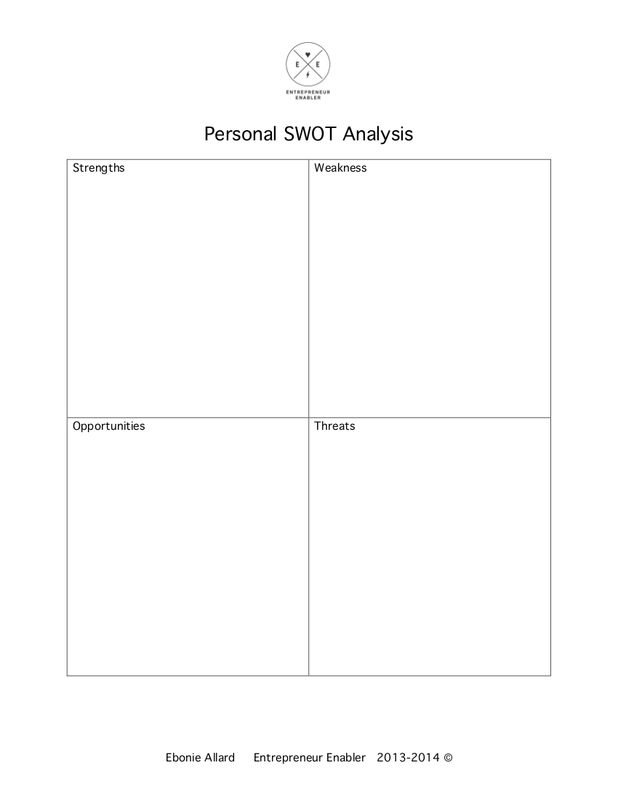 The results of your personal SWOT analysis could be a make or break your personal development. Your honesty will directly affect the reliability and credibility of your personal SWOT analysis results. 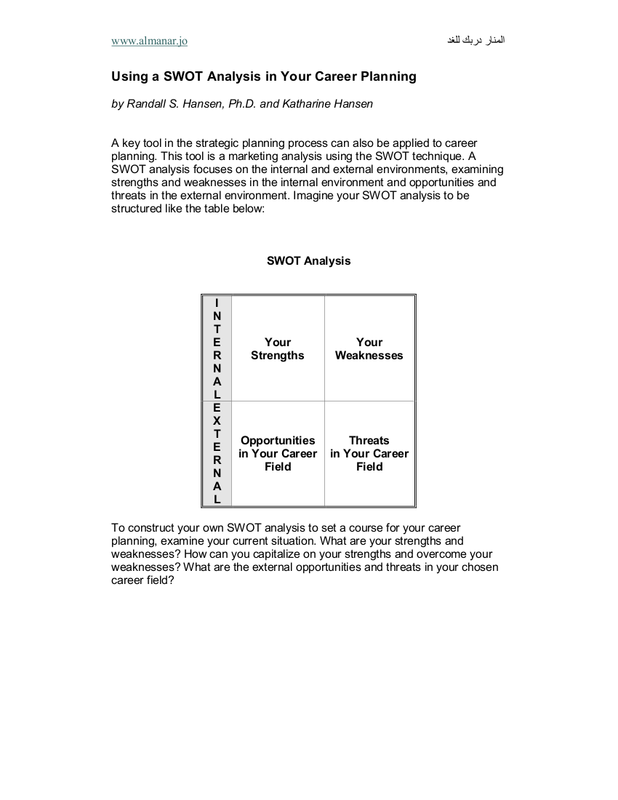 Conducting a personal SWOT analysis can be helpful in assessing yourself. You could be assessing yourself to see if you will be able to meet the requirements of the job you are applying for or the promotion you are seeking. Knowing your strengths and weaknesses beforehand will be able to help you in identifying gaps and in preparing you to become the best candidate for the position you are applying for. 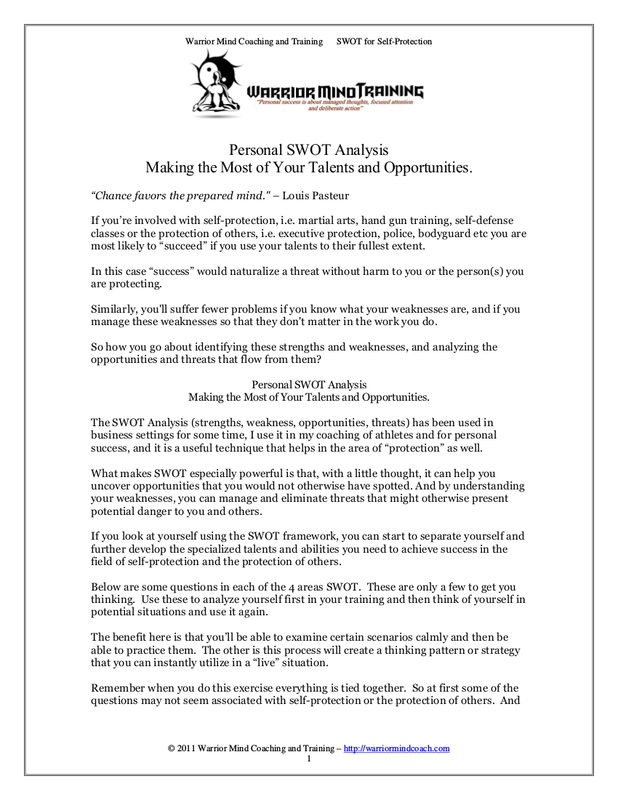 Through SWOT analysis, you will also be able to identify opportunities that is beneficial for your development and you will also be able to neutralize or overcome threats that could hinder you from achieving your dreams, goals, and ambitions. Now that you have learned something about SWOT analysis, the question now moves on what to do next. After conducting a personal SWOT analysis, you will be able to determine potential ideas, actions, and goals, as well as analyze information, and build a strategy — but most importantly, you will be able to MATCH and CONVERT. Matching happens when you would connect two categories from the SWOT analysis in order to form or determine a course of action. The categories that should be matched are strengths and opportunities. This is where you draw the line in being aggressive when it comes to achieving what you want to achieve. Another pair of categories that should be matched are your weaknesses and threats. This is where you become defensive and where you identify the points where you need to make an extra effort in order to improve yourself. Conversion here simple means turning your negatives into positives, making your weaknesses into strengths and seeing opportunities in your weaknesses. For example, you want to be a blogger but can’t afford to hire a team to assist you in your business operations. Additionally, you don’t know how to utilize graphic and layout design to make your blog visually appealing. You can turn your lack of design skills into a strength as you can learn that new skill. Learning new skill sets can open new opportunities that could also be helpful in your endeavors. 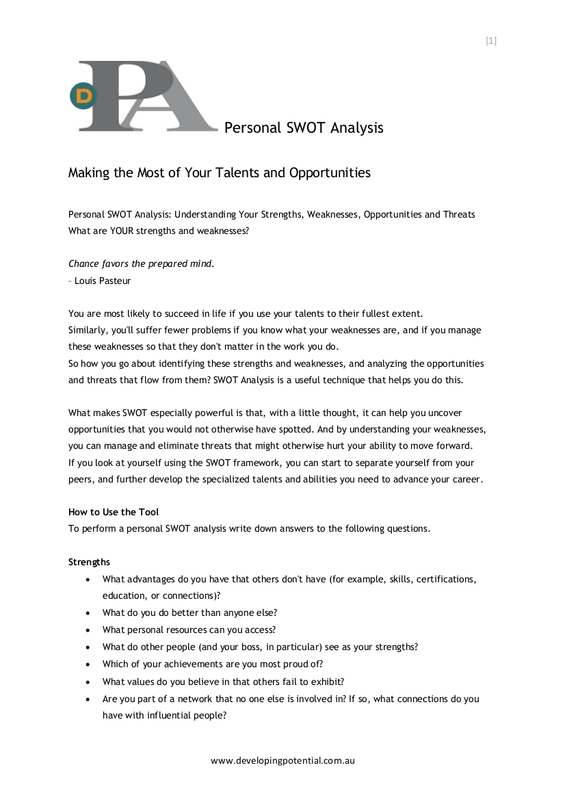 Do not put your personal SWOT analysis to waste by treating it as a mere to-do list. For a SWOT analysis to be effective, you have to take action on the results of your assessment. If there are things that you need to convert in order to achieve your fullest potential, then you have to be determined to achieve it.